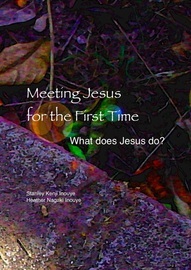 The Leader's Guide provides general guidelines for using the Meeting Jesus for the First Time, "What does Jesus do?" book in a group setting and suggestions as to how to adapt its use in different settings and with different audiences whether young or old, male or female, seekers, believers or a combination of both. Also, included are specific guidelines for conducting the two beginning sessions and the two ending sessions which are added to the six basic units of the Renewal Series transforming it into the Seeker Series. Handouts for these four sessions are also available for download so they can be printed and copied for distribution. Some have found these supplementary units to be both enjoyable and meaningful for believers as well seekers. so you might want to include some or all of these sessions for renewal and discipleship purposes as well as for evangelism. The Leader's Guide is presently being reformatted to a book format from its previous binder format for piloting and field testing. As soon as the reformatting and proofing process is completed it will be available on Amazon. Meeting Jesus for the First Time, "What does Jesus do?" The six re-imagined, first-person narrative stories based upon the biblical encounters Jesus had with real-life people who were miraculously transformed by meeting him make up the core content of both the Seeker Series and the Renewal Series. In addtion, this book includes Reflection Questions for personal as well as group discussion followed by a Personal Application Starter and Personal Application Questions which are intended to help group participants after the group meets realize implications each story may have upon their personal lives. The book version of Meeting Jesus for the First Time has been reformatted from its previous binder format for piloting and field testing and is presently being proofed prior to distribution on Amazon which we expect will be very soon.